Underside of the machine. The feed rods didn’t shine up, but pretty much everything else did. 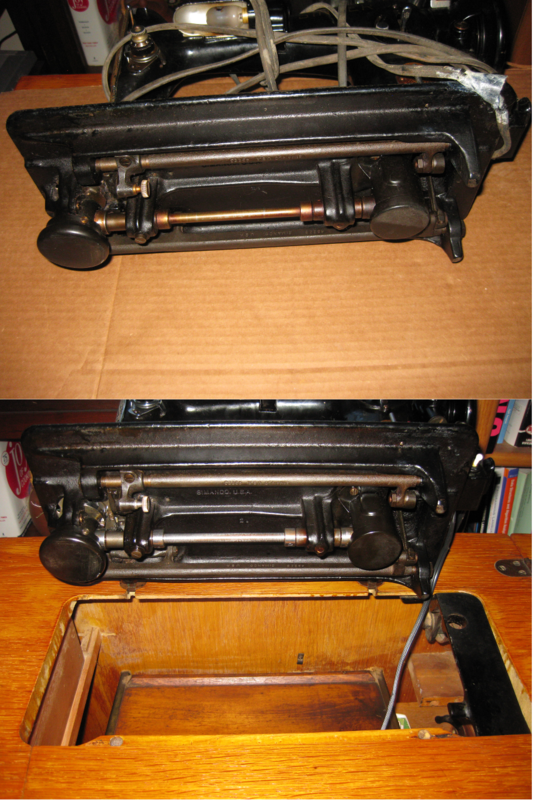 Hi, I have my grandmother’s 1947 201-2 Singer sewing machine and I want to lubricate the motor. I opened both screw caps underneath the motor and the grease looks like it has jelled. How do I clean this out? Can I use Q tips and should I use any type of solvent? Also, I have ordered Singer brand motor lubricant from an online supplier and was wondering, does this have a runny consistency or is it more like a gel? If it is a runny consistency, how do I know how much to put in. If it’s runny, then I will have to do put the caps back on before it all runs out. Thanks, for any help you can give me. Check out the main post, I talk about and show working in the motor, VSSMB also has a nice post focused on re-wiring that also includes cleaning. It’s hard to do a good job on the motor without disassembling the thing, cleaning out the grease through the access holes with a Q-tip will drive some of the old dead grease into the motor action, you don’t get much in the way of access to the worm gear and that is where the bad grease is most likely to be problematic. I’d be really careful with solvents inside the motor casing, very easy to dissolve insulation or leave moisture and cause a short. The typical motor lubricants are quite thick – think petroleum jelly (Vaseline), since that tends to be the dominant component. I just cleaned one and I think there are a couple of screws missing from the bottom. I don’t have the vocabulary to say exactly where. Is there a diagram I can reference? Also were the ‘wicks’ mentioned in the manual stuffed into the presser foot tension adjuster as well as inside the gearbox in the back? What do you do about those?! The adjuster’s manual (locally hosted copy) has parts breakdowns for every subsystem that you should be able to find any errant screws from. You can get proper felt wick pretty easily (that’s what I did), or just roll up a strip of felt to the appropriate 3/16″ diameter, put a stitch or two in it to keep it rolled, and slip it in; the wick is just to help encourage lubricant to linger and re-distribute. I only recall them going in the presser foot and motor.